A few days ago, a couple of friends were going to a village called Dahod to meet an NGO Sahaj India. Since they were going via Baroda, I tagged along. The route to Dahod was picturesque with varying shades of green all around. Closer to Dahod it seemed like we were driving in a lush green valley. Dahod is one of the towns in the tribal belt at the border of Gujarat, Rajasthan and Madhya Pradesh. For a long time Dahod was (to some extent still is) notorious for robbery and the Baroda- Indore highway was largely deserted during the night for fear of tribals. When we met Ranvir, the co-founder of Sahaj India, he very naturally started talking about the villages, the tribal population, the problems and how the desire to end the violence and bring meaningful employment to the people of Dahod resulted in the movement called SAHAJ. All the time that he spoke, I wished for a voice recorder. His passion flowed in his words, but well I just had to bank on my memory and all that which follows come entirely from that. While the landscape is green in the monsoons, Ranvir quickly pointed that come summers the land would be dry and parched. Water is scarce and agriculture is limited to corn, which provides employment only for a couple of months. There are no industries and thus people had little option but to migrate to towns. Life in cities for migrants is not easy. Looking for work daily and living on streets poses problems of health and safety especially for the women and children. Also migration meant leaving the elderly behind with no one to take care of them. Those who stayed back took to bows and arrows earning the place the ‘dangerous’ tag, which further discouraged new businesses. A chance meeting in MSU Baroda, brought Ranvir and Jabeen, both residents of Dahod, together and from there started a journey of passion and commitment towards bringing dignity through meaning employment to the tribal population of Dahod. As Jabeen says “…and since that day we have been travelling together”.A follower of Gandhian philosophy, Ranvir was sure that the way out of poverty for the villagers was to develop cottage industries. The biggest challenge as Ranvir recalls was to convince people to learn the crafts and work for a living. The idea of an NGO was also very distorted in the minds of the locals. Their only interaction with NGOs was when certain organisations came to take some signatures and in return gave them some money. It took time to earn people’s trust and support. 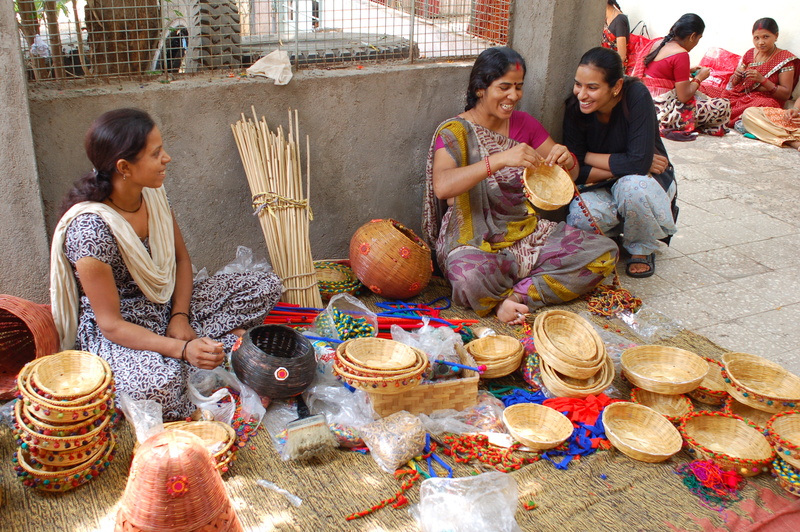 Almost 15 years ago, Sahaj started with 8 employees and 12 women artisans in 1 village. It has now grown to 80 employees, 60 villages, 3000 artisans and over 1600 products spanning different crafts like paper mache, jute and Bamboo artifacts, quilting, beading etc. Artisans decorating Bamboo baskets and lampshades. Ranvir had himself trained the first few women in the crafts, who are now teaching other members of their community. Jabeen and Ranvir also travelled to different organisations like Shantiniketan and Auroville to understand the marketing of handicrafts. Today craft from Dahod is not only sold in all the major cities in India, it is going international and even international designers are coming down to contribute new designs and crafts to Dahod. So what was the key to this success? According to Ranvir the success lies in the way the organisation is run. In his words Sahaj is a “Corporate NGO”. This reminded me of Pallavi from eyaas who had said “Heart of a non-profit, Mind of a business”. Sahaj is not a charity. When Sahaj started it had some support from it’s parent organisation: Sadguru Water and Development Foundation and it gets some minimal support from various government schemes like Adivasi Kalyan Yojna and Rashtriya sum vikas yojna. By and large Sahaj is a self-sustaining organisation, which is very much the part of the market and runs in accordance with it. The difference between Sahaj and any other for-profit handicraft business, as Ranvir puts it, is it’s key asset – the artisans. If the demand for Jute product in the market decreases, the for-profit business will stop sourcing from the jute artisan but Sahaj on the other hand will train the jute artisan in newer and contemporary crafts ensuring his/her livelihood. Fair trade and a commitment to the villagers are the core values that run through the organisation. In the market Sahaj’s strengths lie in assured quality, contemporary designs and competitive rates. 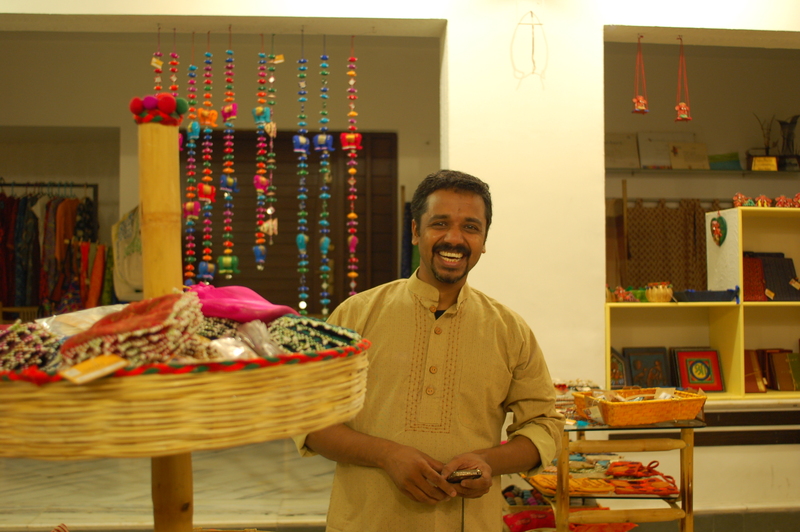 Sahaj sells affordable handicraft; thus tapping the growing middle class of consumers. Instead of selling one item as an art object for a higher rate and thereby bring income to just one artisan; Sahaj belives in selling 100 items at lower rate and thus bringing livelihood to 100 artisans. We also got a chance to go into the villages and see the women artisan working. Most of the women collect a week’s raw material from the main office and return the finished product the week after. This allows them to work from home, look after kids and family and help in the farms when required. We met Kanta Ben who has been with Sahaj for over 10 years. She proudly tells her story that how Sahaj not only helped her pay off her loan from the local money lender (who was charging her 120% interest) but the regular income has enabled her to build her own home and also marry off her 3 children. In the market? Of the market? OR against the market? Disclaimer: The article is a result of informal conversation with Ranvir Sisodia, Senior Executive Officer and Design Head, Sahaj and visit to Sahaj India operations in Dahod, Gujrat. Any factual errors, misunderstandings and misinterpretations are my own. Thanks Kaval! Are you from Dahod?